Clipper is America’s leading supplier of sauté pans to premier global restaurant chains. Our Clipper Commercial brand bring the incredible functionality and durability of our famous foodservice items into consumers’ homes. What’s more? Clipper Commercial items have been tested in the fires of the world’s busiest kitchens. 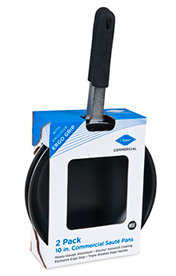 The commercial pans from Clipper feature heavy-gauge 3000M series aluminum with broad, wide bases and gently sloped sides that make it easy to flip food or slide it from the pan to a plate. Our triple riveted steel handle stays cool to the touch with our exclusive Ergo Grip. The patent-pending grips can be removed for oven use and easy cleaning. The nonstick Eterna® coating makes clean up effortless.